The San Luis Obispo Blues Baseball team is a not-for-profit summer collegiate baseball organization that provides affordable family fun, while giving players a chance to continue to practice and excel at their sport. 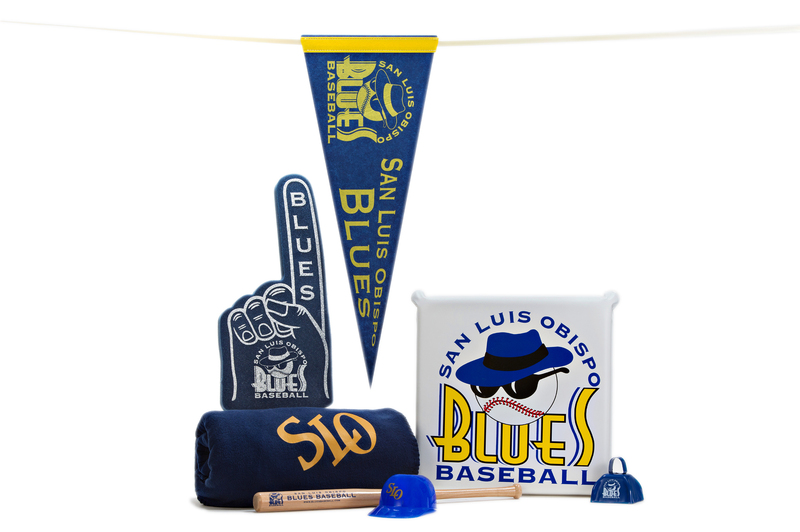 Over the years they’ve looked to promotional products as a way to increase sponsorships (the cowbell and seat cushion are co-branded on the second side) and also increase fan spirit and revenues through merchandise (the pennant, #1 finger, blanket and mini bat are for sale). They also sell peanuts in the souvenir mini-helmet, so you can snack while you root, root, root for the home team! The San Luis Obispo Police Department continually uses branded giveaway like car stress relievers and slap bracelets to increase public awareness and educate kids. However, for the Police Chief’s Roundtable Group, they needed something a little nicer and a little more adult. This group of volunteers provides a direct interaction between the community and the government. 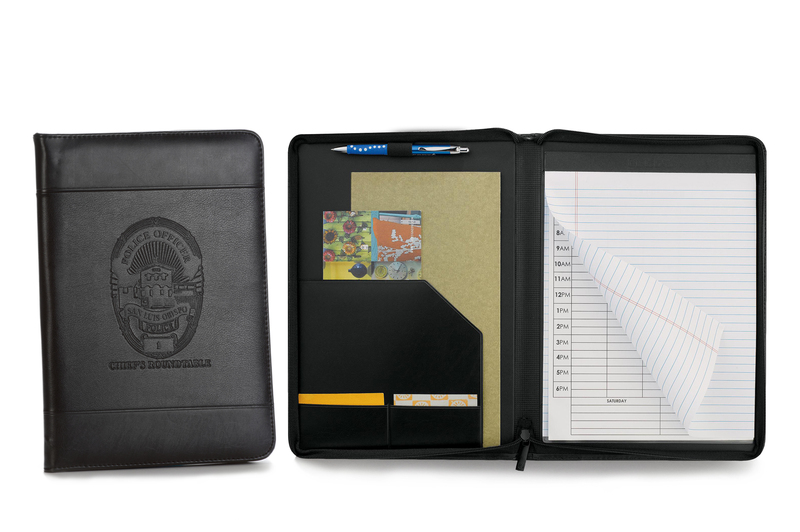 As a thank you for volunteering their time, SLOPD wanted to provide a useful and special debossed leather padfolio for members to keep notes and information during these important meetings. As a marketing firm, LEVEL Studios not only cares about the brand of their clients, but they care deeply about their own brand as well. We understand that passion and took great care in helping them select the right products to show-off their logo on employee gifts. 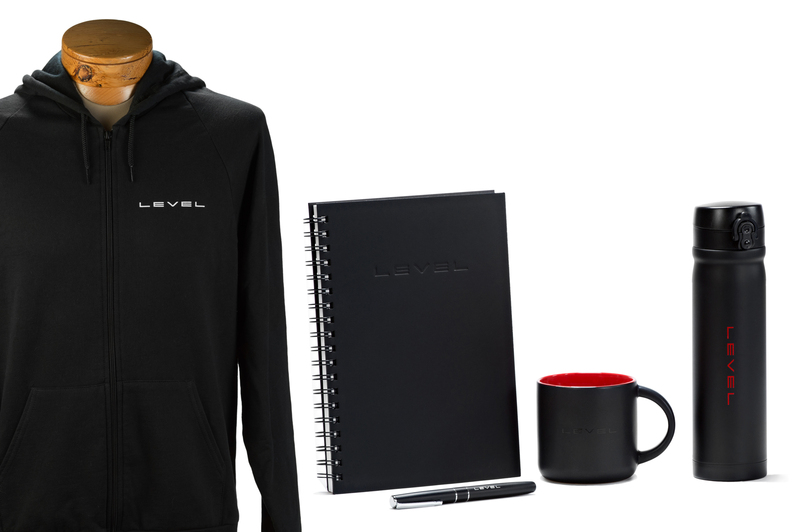 By ordering samples and looking at unique imprint options, we were able to help them pick out this high-quality mug with tonal imprint, vacuum insulated tumbler, heavyweight rollerball pen, leather-like notebook with debossed logo and a comfy unisex hoody. Employees felt proud to promote their company while using these products. Pismo Beach Seacrest Oceanfront Hotel has been one of our most loyal clients for years. They use branded products in a variety of aspects to keep hospitality strong. They do quarterly themed gifts for strategic partners (tote bag, ice cream scoops (not pictured), sunglasses), giveaways for guests and at tradeshows (sunglasses, pens, lip balm, post-its), resale merchandise in the lobby (beach ball, playing cards), and provide special packages for their furry guests (dog toy and pet water bowl). 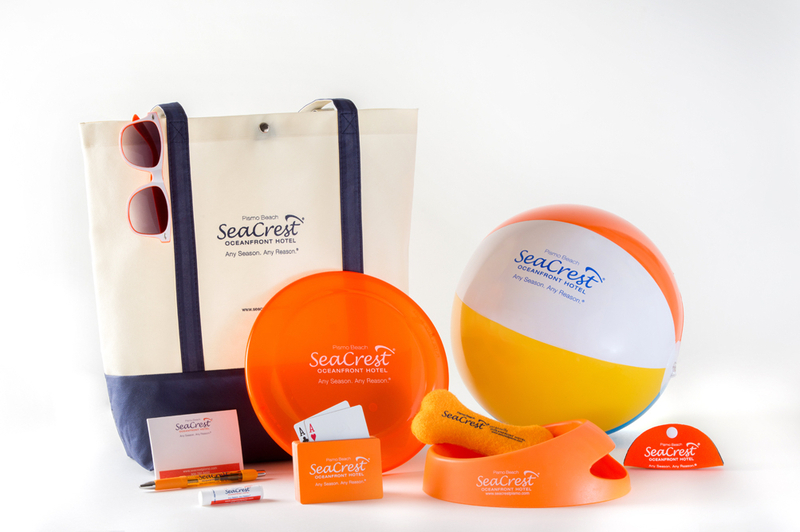 By keeping their colors and branding consistently strong and Orange in all of their products, Seacrest is making a big impression! Tourism agency Visit SLO CAL (or Visit San Luis Obispo County) went through a re-brand and was looking for new products to really represent the quality and colors of their new logo. Some products were to be used at tradeshows throughout the year and other for special media and industry events. These beautiful luxurious journals and colorful soft pens really represented not only the new logo but the entire feel of the central coast. It was also important to showcase was the “Life’s Too Beautiful to Rush” tagline. 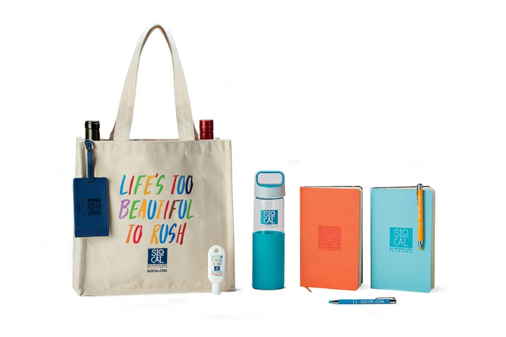 For that, we found this lovely canvas two-bottle wine tote and sunscreen which allowed for a full-color imprint. The silicone-sleeved water bottle and leather luggage tag rounded out the merchandise. Every holiday season The Villages of San Luis Obispo looks for a special gift to say thank you to strategic referral partners and also do something special for their residents. For that, they decided on these crisp, white weekly planners. 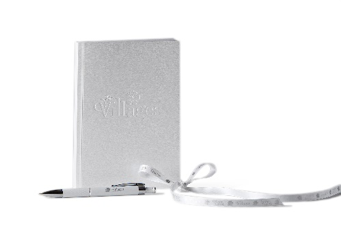 Such a useful and beautiful gift, they made them even better with a thatched grip metal pen and matching custom ribbon. After CoastHills Credit Union rebranded, they really wanted to show off their new logo. The problem is that many promotional products limit the number of imprint colors that you can print and their adjusted logo really shined in full color. We went to work researching some great giveaways that would be well received by potential clients to increase awareness and also allowed for a full color imprint. 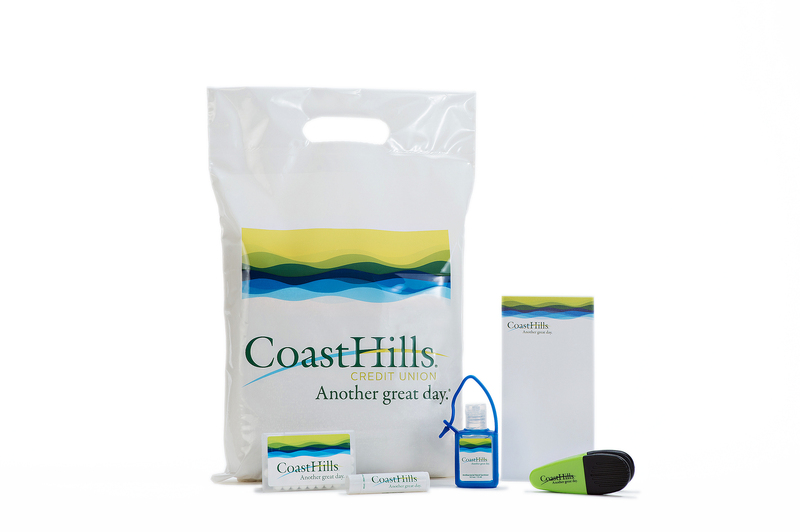 These small disposable plastic bags, mints, lip balm, hand sanitizers and notepads allowed CoastHills to celebrate their new, colorful branding.